Stay Connected and Communicate with your Parents! As a childcare center director communication between you, teachers and the parents, is vital for the success of your center or school. iCare management software provides you a variety of the best communication tools – SMS, email, messaging via the Lobby, email and SMS notifications, mobile phone dings and several configurable alerts. Structured Email: Get things done and look professional with the iCare email formatter. Individual or Group: Send any of the above messages to an individual or a group of any size. 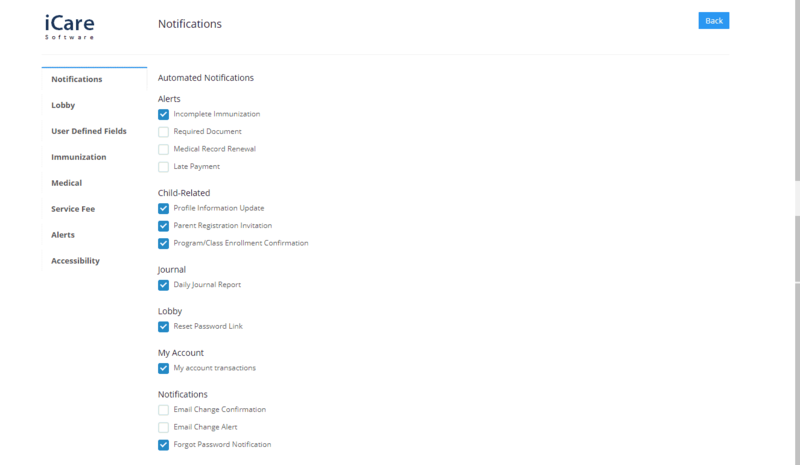 Following alerts will be sent out automatically if turned on and will also appear in the Admin Dashboard. Absence Alert: Send SMS text to parent if child doesn’t arrive within 10 minutes of the scheduled time. Incomplete Immunizations: Reminder email will be sent to the parent 30 and 10 days before the next due date for each type of immunization shot. Renewal of Medical Records: Reminder email will be sent to the parent 30 and 10 days before the next due date for each type of medical record. Required Documents: Reminder email will be sent for Incomplete Electronic Documents. Late Payments: Send email reminder to parent if payment is late by 20 days. Registration Checklist: Children will not be activated until all registration requirements are complete. Child’s Arrival Announcement: Announce child’s check-in to the teacher. And, if not acknowledged by teacher in 5 minutes then announce to admin.